The Tour de Georgia was North America's premier, professional cycling event and rolling festival from 2003 to 2008. It shined the world's spotlight on the state of Georgia each spring, the international event was an annual, multi-day, professional cycling stage race that drew the most elite cyclists and showcased one-of-a-kind towns and terrain of the Southeast. Sanctioned by the Union Cycliste Internationale (UCI) and USA Cycling (USAC), the Tour de Georgia was one of the three events in North America ranked as an Hors Classe (2.HC) stage race event, making the event one of the top-ranked stage races in the world. The other two races ranked 2.HC by the UCI, cycling's international governing body, are the Tour of Missouri and the Tour of California. The Tour de Georgia took cyclists and spectators through Host Venues including Peachtree City, Macon, Thomaston, Rome, Chattanooga, Tenn., Chickamauga, Lookout Mountain, Brasstown Bald Mountain, Dalton, Lake Lanier Islands, Stone Mountain Park, and Atlanta GA. The race covered over 600 miles in seven days. Millions of spectators attended the Tour de Georgia to watch 15 of the best national and international cycling teams compete. Close to 4,000 volunteers dedicated their time and efforts to making the event safe for participants and spectators. In 2006 the Tour generated a direct economic impact of $26 million to the state economy. The Georgia Cancer Coalition was designated the charitable beneficiary of the Tour de Georgia every year since its inception in 2003. The Tour raised $150,000 over a period of four years for the Coalition from corporate sponsorships, drawings, raffles, merchandise sales, and the BriarRose Grand Peloton. Funds raised during the Tour de Georgia went directly to the Georgia Cancer Coalition's Cancer Research Fund. In conjunction with donations from Georgia's citizens who indicated their support for cancer research on their income tax returns, the Coalition was able to award eight (8) cancer research grants totaling more than $400,000. The Tour de Georgia was owned by the Georgia Partnership for Economic Development (GPED) and was governed by the GPED Board of Directors. As a 501c(6) non-profit entity, GPED's mission was to develop the Tour property as an economic and marketing property for the state of Georgia and for the benefit of the Georgia Cancer Coalition. The GPED Board of Directors contracts with Medalist Sports, a full-service sports marketing company based in Georgia, to oversee all event management and marketing. The Tour de Georgia was cancelled during 2009 and 2010. It's backers tried unsuccessfully to find a sponsor so that they could bring back the Tour de Georgia in 2011 or 2012. The Tour de Georgia was started by the Georgia Department of Economic Development to benefit of the Georgia Cancer Coalition. Later starting with the 2008 race, The Aflac Cancer Center and Blood Disorders Service of Children's Healthcare of Atlanta becaame the race's official beneficiary organization. The Tour de Georgia increased tourism in Georgia providing 2.3 million visitors and a $26 million economic impact between 2003 and 2006. The race generated international attention when the U.S. 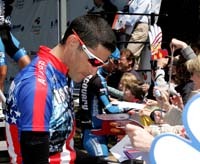 Postal Service cycling team began using it as part of Lance Armstrong's preparation for the Tour de France. Armstrong rode in the race before his Tour victories in 2004 and 2005, winning in 2004, and Floyd Landis won it before his Tour victory (later disallowed) in 2006. The event lasted seven days. In cycling each days race is called a stage. The entire race covered over 600 miles in Georgia. It may come as a surprise to some to learn that cycling is a team sport. In fact, it is one of the most strategic team sports of all. In a typical pro race such as the Tour de Georgia, teams have 8 riders each. Each team has its own game plan for winning, and each rider plays a different role in that game plan. Most teams have one leader. His teammates play the role of domestiques, who sacrifice their own chances of winning in support of their team leader. A domestique is the "worker bee" of the team, protecting the leader from the wind, chasing down breakaway riders, fetching water or clothing from the team car, and even sacrificing their wheels or bicycles for the leader in certain situations. One of the most crucial concepts in team racing is drafting. Riders can conserve energy by riding in the slipstream of another cyclist. As a result, teams try to surround their leader with teammates, keeping him out of the wind and fresh to attack at the right moment. Different formations can increase the energy-saving benefits of drafting, such as forming an echelon, and wind can necessitate a variety of drafting formations. Teams also develop complex strategies to win specific stages and the races within races, such as points for King of the Mountain or Sprint competitions. Not only do teams designate a leader for the overall race, but many also select riders to try and win the jerseys that are awarded to the best sprinter and best climber of the Tour. For the first three years of the Tour de Georgia (2003 - 2005) the primary sponsor was Dodge. During 2006 the race was sponsored by Ford Motor Company. Finally in 2007 and 2008 the primary sponsor was AT&T. Additional sponsors have included GE, United Community Bank, Blue Cross Blue Shield, Georgia Power and many others. The website is sponsored by Slender Source where you can order Isagenix products for fat burning and improved athletic performance. Five special award jerseys were presented to professional cyclists during the Tour de Georgia Stage Race. In professional cycling, these jerseys carry honor and prestige for the person who gets to wear it during the next day's stage. The Overall Leader Jersey signifies the leader of the General Classification, or GC. The cyclist with the least overall accumulated time is awarded the Race Leader Jersey, and at the end of the race is crowned the race champion. Honoring the traditional yellow worn by the leader at the grand daddy of all cycling stage races, Le Tour de France, the Tour de Georgia Overall Leader Jersey is made with the same yellow color. Stage races like the Tour de Georgia often incorporate sprint lines throughout the race, where cyclists can accumulate points by crossing the lines in either first, second or third position. Regarded as the "race within the race," the rider with the most points is awarded the Sprint Leader Jersey. Georgia has plenty of mountainous terrain, giving many opportunities to cyclists to accumulate King of the Mountain (KOM) points. This jersey is awarded to the cyclist who has accumulated the most points by reaching predetermined lines on mountain roads typically at the crest of a climb in either first, second or third position. The Best Young Rider jersey is awarded to the cyclist with the lowest accumulated overall time in the General Classification (GC) who is under 22 years of age. This up and coming rider typically is "one to watch" as a potential international cycling star of the future. The most subjective jersey awarded during the Tour, the Most Aggressive Rider jersey is given at the end of each stage to the rider who is judged to have instigated the most attacks and breakaways.